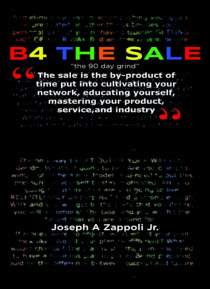 B4 the Sale brings us back in time to the old-school truths of belief, education, and networking; then we are led swiftly into a bright, exciting future. Joseph's intent is to motivate you to the point of unbreakable determination, like the way you felt when you left the theater after watching Rocky or Braveheart. In the case of a movie, your excitement probably evaporated the next day, but after … you've completed B4 the Sale, you will be pounding the pavement, filled with relentless passion to make your next sale that day and every day you are still breathing! Joseph will teach you how to be fearless and how to GET OUT OF YOUR OWN WAY. He stays in the grind with you now and into the future-always learning, selling, and sharing. Joseph insists that being a topnotch sales professional requires you to be honest, teachable, presentable, fearless, approachable, generous, and to develop an unwavering ability to attract people to you. Otros eBooks de Joseph A Zappoli Jr.